Introducing the Speaking of Travel Climate Listening Project Series with Dayna Reggero of The Climate Listening Project. Dayna presents an ongoing educational series with guest experts who discuss climate change and its impact on the places we love to travel, as well as how to become sustainable travelers. Introducing the Speaking of Travel + Climate Listening Project Series with Dayna Reggero of The Climate Listening Project. Dayna presents an ongoing educational series with guest experts who discuss climate change and its impact on the places we love to travel, as well as how to become sustainable travelers. We know climate and weather are important factors in our decision-making around travel. And this coming year promises to provide new and challenging opportunities for those involved in climate change and how it relates to travel. Our goal is to focus on hope and to inform you of what’s happening to our planet and our weather so you are prepared as you make your travel plans. Throughout the year, you’ll have more opportunities to listen to experts about how we can find common ground and become more conscious of leaving a smaller footprint as we embark on our journeys. We’re embarking in this new transformative year of wonder and Dayna Reggero has taken her Climate Listening Project across America and around the world to film real people sharing their climate change stories. Dayna’s guest experts connect climate change stories with discovery. Remember, only dreams give birth to change. So let’s all dream BIG! As we move forward, you’ll have more opportunities to listen to experts and learn how we can find common ground and become more conscious of leaving a smaller footprint as we embark on our journeys. Why is biodiversity important to the places we love to travel? 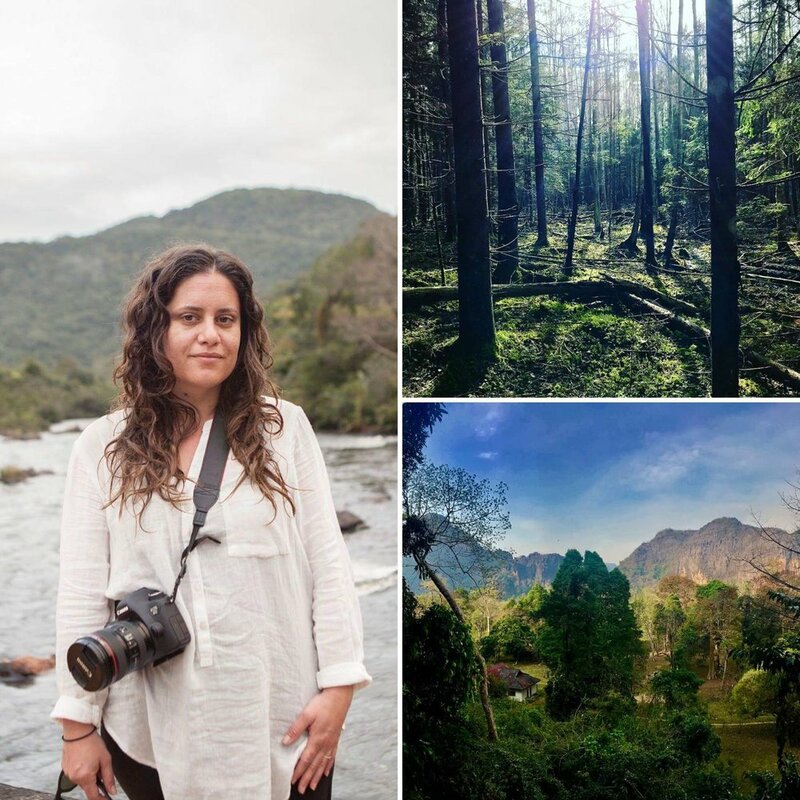 The 2019 Speaking of Travel Climate Listening Project Series with Dayna Reggero begins with a discussion around Dayna’s recent photography series “Voices of Hope for Forests,” featuring individuals from around the world who are working together to protect forests as part of the Environmental Paper Network. The Environmental Paper Network is made up of 140 organizations who are working together on a Global Paper Vision for the pulp and paper industry. Guests include Josh Axelrod of the NRDC (Natural Resources Defense Council), Beth Porter of Green America and Amy Moas of Greenpeace. The Climate Listening Project is honored to collaborate with PBS series Ecosense for Living, a thought-provoking series of eco-topics ranging from reconnecting kids to nature, green jobs, and healthy lifestyles limiting the impacts of toxins on our home and bodies. The series aims to empower viewers with practical solutions geared toward saving money, treading lighter on the planet, and improving quality of life. Joining us is Suzan Satterfield, producer and director of PBS series Ecosense for Living who shares stories and ideas to become a smarter, greener traveler. The Speaking of Travel + Climate Listening Project Series continues with Dayna Reggero and student guests explaining the importance of learning about climate change to educate people and protect the places we love. Artist/biologist Shannon Bodeau has a new Climate Listening Project in collaboration with the UNC Asheville McCullough Fellowship. She interviewed people from around the world and created hand-drawn graphite portraits. The Climate Listening Project Portraiture Premiere will be a unique opportunity to listen to powerful human stories through a fresh perspective, weaving science and storytelling through art. 9th graders Skyelar & Kalani, along with teacher Jerry Lubos from the Franklin School of Innovation in Asheville, NC., are creating podcasts focused around relevant connections to the guiding question “how do small actions lead to big changes? Nearly 90 ninth grade students have worked together to create their own Climate Listening Projects and have interviewed people from around the region as part of an intensive long-term study focused on climate change. Joining us for a special Earth Day episode of Speaking of Travel + Climate Listening Project is Jill Kubit of DearTomorrow (USA) and Frida Berry Eklund of Föräldravrålet - Parents Roar (Sweden). More than 100 women from countries around the world gathered at the United Nations in NYC this month for a UN Women's International Forum on climate solutions. Dayna Reggero was there to listen and join this important moment and movement with Queen Mother Dr. Delois Blakely, former EPA Administrator Gina McCarthy, Lead Negotiator representing Palau and The Alliance of Small Islands States (AOSIS) including 40 nations H.E. Ngedikes Olai Uludong, Telemundo Network Emmy award winning Journalist Vanessa Hauc, Climate Mama Harriet Shugarman, President of Women’s International Forum Latica Tomašić Kickert, Our Kids' Climate, a global network of parent-focused climate organisations, and many others to pledge to Leave It Better Than We Found. In this episode, we discuss this historic event, plus share practical Earth Day tips for all.